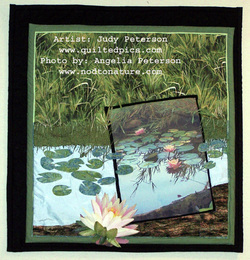 Judy Peterson & Angelia Peterson welcome you. Picking up my first needle with my Great grandmother as a child...the journey started. I have worked in many mediums as my interests have snowballed. I have both professionally oil painted and taught others my technique, have taught school when my children were small, but for me it always comes back to the needle and thread. Please enjoy your journey through my creativity. Living in the beautiful Willamette Valley of Oregon we are taken in by the landscape that you will find darting through our work. We are within an hour from the beach, the snow capped mountains, rivers are abundant in our back yard, while wildlife crosses our path the needle drops into the cloth creating our designs. Always looking to add a new technique and texture to our quilts the ideas are never ending. Original designs are our specialty. I have teamed up with my daughter, Angelia, a professional photographer, who designs with me, but has no interest in sewing. The ideas we come up with are forever stretching the "box". All of our designs are original creations; some of the quilts you will see are either a re-creation, an addition, or have her photography printed and added right in to the quilts others are completely built on an idea. If we cannot find the perfect shade of fabric for our creation will hand-dye or paint in the perfect color.